Each time I am in the presence of the stunning majesty of a glacier, I am aware that nature’s beauties outshine many man-made structures. The first waterfall as we traveled the fjord. 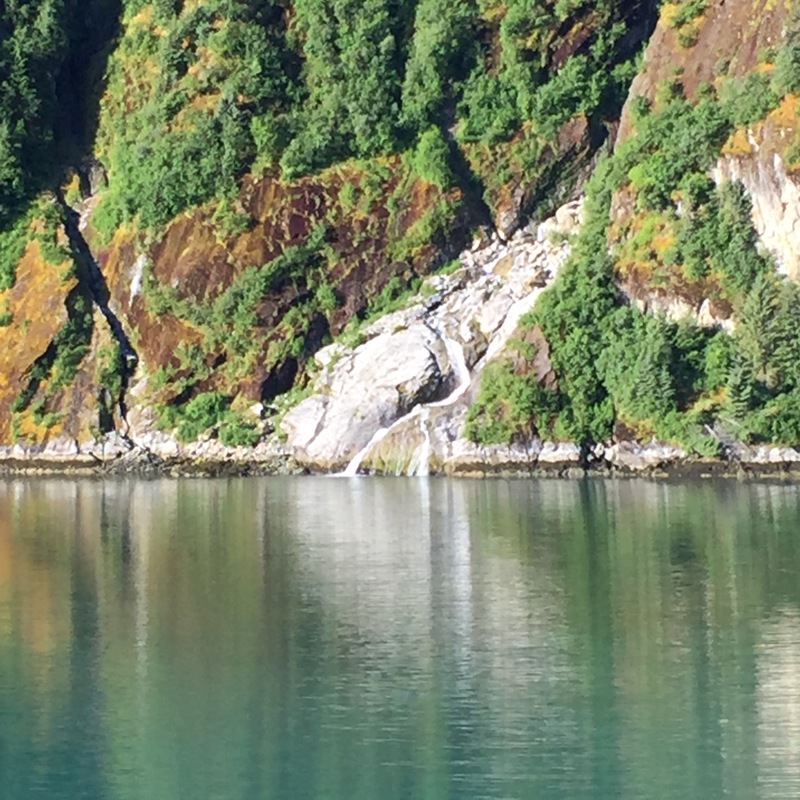 As we sailed into a fjord in Alaska early this morning I was watching for the signs that a massive glacier was near. First were the signs in the water: the change in the color and texture. Once smooth, now choppier with thin ice. Then came the first, now tiny, ice floe making its way down the channel. Soon I heard the first sounds. The Wild Rush of water as the summertime waterfalls of gushing water streamed from the ice fields high in the mountains. I watched as the pounding water made its way into the fjord leaving swirls of water as it entered. Later you can hear the moaning of the glacier as it moves forward down the mountain. 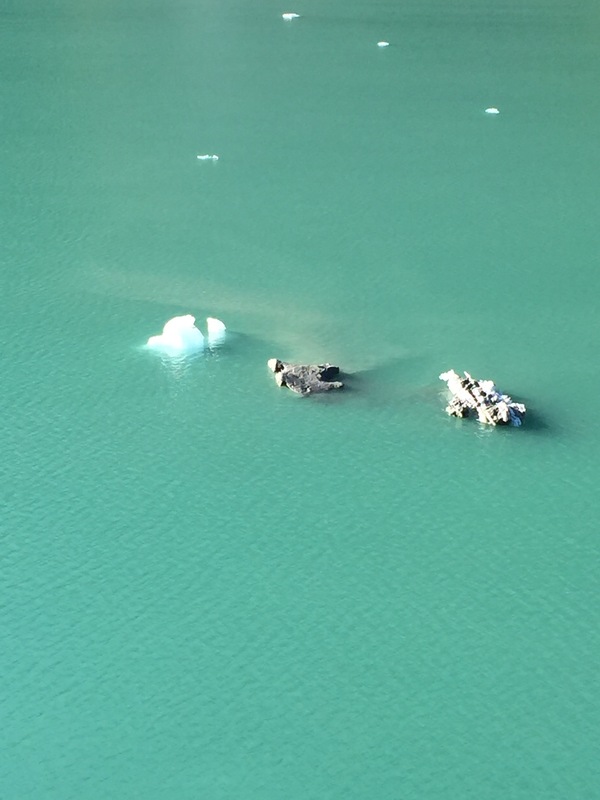 Sometimes you can see and hear the crash as giant sections of glacier calve into the water. Ice floes traveled down the channel to greet us. Soon larger and larger ice floes floated along side the ship. Not the size of an ice berg, but still sharp white and Aqua blue structures shimmering in the sunlight. They can be dangerous and the ship shows respect by moving ever so slowly down the channel. I have been blessed to have seen glaciers in Alaska in 2002 and now today. Four years ago I traveled through the Straits of Magellan and experienced the cold of the glaciers there as well as we winded our way from Chile to Argentina. But now, in Alaska, I began to feel the cold wind that comes off the glacier. Even with a coat and gloves, even with the sun shining, I felt deeply chilled. My first view of Daws Glacier. Then the ship made a small turn. Up ahead I saw the glacier filling my view. Its face jagged and tall as it met the water. White and blue with streaks of broken rock within that looked like stripes of dirt. But are really the crushed stone and silt pounded by the relentless force of the glacier. The glacier fills the end of the fjord. Seeing a glacier in a bay is different then seeing it more inland ending in a lake like the Mendenhall Glacier in Juneau. I saw that glacier first in 2002 and then again two days ago. I was shocked by how much it had retreated! There was even a time-lapse movie of how it has changed from 2007 until now. Imagine six years more of melting! Hundreds of feet of glacier has disappeared. Diminishing it! The park ranger told us how global warming and the use of fossil fuels is changing the glacier and Ice fields in Alaska. There is hope as we move to renewable energy. But if you saw the glaciers, you would know the change is real. 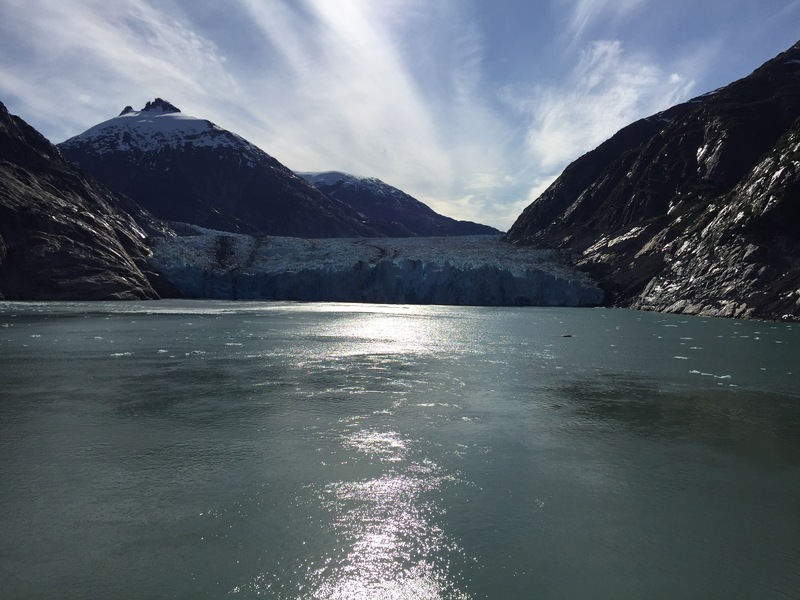 As the glaciers recede in Alaska another increase occurs. As the weight of the glacier diminished the land actually rises in rebound. When we first came to Alaska 14 years ago we took our children. 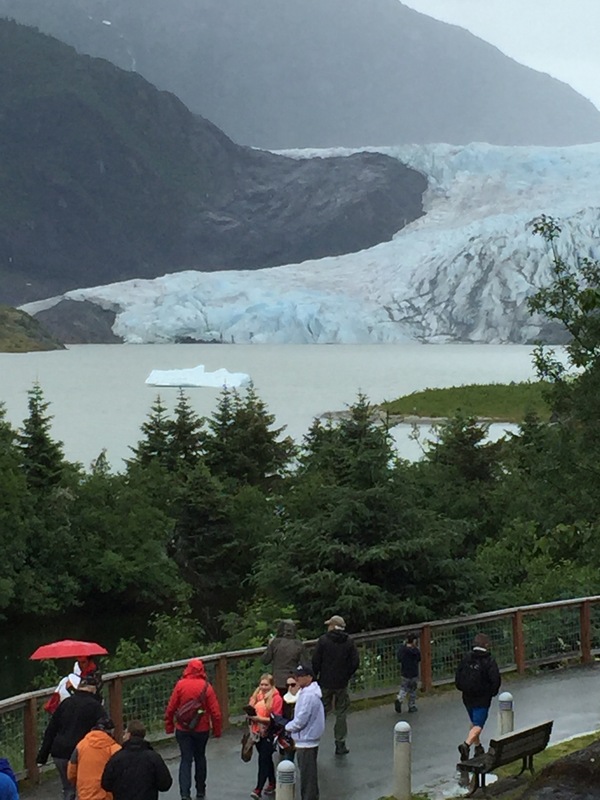 My then 11 year-old son was impressed at first with the Mendenhall Glacier. 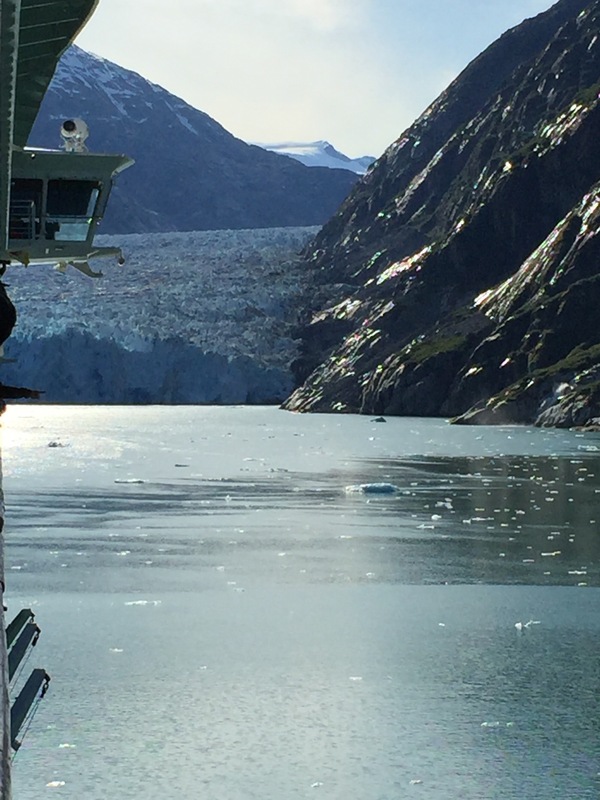 But later in the trip when I woke him early in the morning to see the majestic glacier in Glacier Bay, he was a snarky pre-teen, who commented: “Seen one glacier, seen them all.” This became a major joke in our family, but it is not true. Each glacier has its own beauty. If you ever have the opportunity, come to see a glacier. The ones within the continental USA at Glacier National Park are almost gone. Only in Alaska can you still see them. Do not miss the stunning beauty of a glacier. Beautifully written. I feel as if I was there with you. Another place to add to my list!